Michael McGinniss, a non-commissioned Mortgage Expert at Better, highlights what homebuyers should look for when comparing FHA and HomeReady. Trying to figure out how to buy a home while you're still paying off student loans? Still recovering from a blip on your credit report and wondering if you can qualify for a mortgage? Looking to buy a home for the first time, but sky-high rent has drained your savings? Many of us face these types of financial obstacles in our journeys to homeownership. If you’ve looked into affordable home financing options to help you overcome these hurdles, you’ve probably come across FHA loans. At Better, we offer a loan similar to FHA called HomeReady. HomeReady and FHA loans are comparable in that they are both designed to make homeownership more accessible to those who face financial challenges like low down payment funds and limited income. While both loan products may appeal to homebuyers looking for affordable financing, there are some clear differences between the two. In this post, we'll break down HomeReady and FHA loans to help you determine which one is right for you. Our borrowers often have questions about how their credit score may affect the loans that they are eligible for, especially if their score is on the lower end. If you’d like to learn about credit score basics and how to improve it, this post walks you through it all. In general, lenders use your credit score (and the borrowing history that it’s based on) in order to determine your ability to pay back your loans. Having a higher credit score means that you may receive more favorable rates that can save you a considerable amount of money over the life of your loan. Credit score guidelines also apply to affordable lending products like HomeReady and FHA loans. With FHA, your credit score can be as low as 580 if your down payment is at least 3.5% or as low as 500 if your down payment is at least 10%.2 However, the lower your credit score, the higher the interest rate you may receive and the more your loan could cost in the long run. Saving up for a down payment is no easy feat for many homebuyers, but it can seem even more daunting for people with tighter budgets. In fact, having enough money for a down payment is an obstacle for more than half of millennial renters.3 While you may have heard that 20% is the “magic number” for a down payment, HomeReady and FHA loans offer much lower down payment options. Depending on the specifics of your financial history, HomeReady can allow for down payments as low as 3% of the property’s purchase price.4 As we previously mentioned, FHA loans accept down payments as low as 10% if your credit score is between 500 and 579 or as low as 3.5% if your credit score is greater than 580. Your debt-to-income (DTI) ratio is the number you get when you divide all your monthly debt payments by your gross monthly income. In general, the lower your DTI, the more financing options will be available to you. The maximum allowable DTI with HomeReady can be as high as 50%.5 If your new home has an accessory unit, HomeReady may also consider your future rental income, which may boost your qualifying income and improve your DTI. Across the mortgage industry, borrowers are required to pay mortgage insurance for any loan in which their down payment is less than 20%. Mortgage insurance protects the lender in case the borrower defaults and is unable to make their loan payments. The exact amount you’ll pay is based on the type of loan you choose, as well as factors like your loan-to-value (LTV) ratio, which is the number you get when you divide your loan amount by the value of your property. For example, if you put 3% down, your LTV would start at 97%. Mortgage insurance with FHA consists of two parts: an annual mortgage insurance premium (MIP) and an upfront mortgage insurance premium (UFMIP).7 The MIP is actually a monthly fee that is built into your mortgage payment. If your LTV is greater than 90% when your loan is originated, you’ll be required to pay mortgage insurance for the life of the loan -- there is no option to cancel. Oftentimes, this means that you’ll be paying mortgage insurance even after any real financial risk to the lender has disappeared, which can cost you a lot over the life of your loan.5 If your LTV is 90% or less (and even if you put more than 20% down), you’ll be required to pay mortgage insurance for 11 years or the life of the loan, whichever happens first. In addition to the MIP, you’ll also have to pay a UFMIP. This is an additional one-time premium payment that is equal to 1.75% of your loan amount, regardless of your LTV. You’ll be paying the UFMIP in addition to your down payment, and you won’t be getting this money back when you sell your home. You can either pay the UFMIP upfront, as the name suggests, or you can finance it into your monthly mortgage payments. 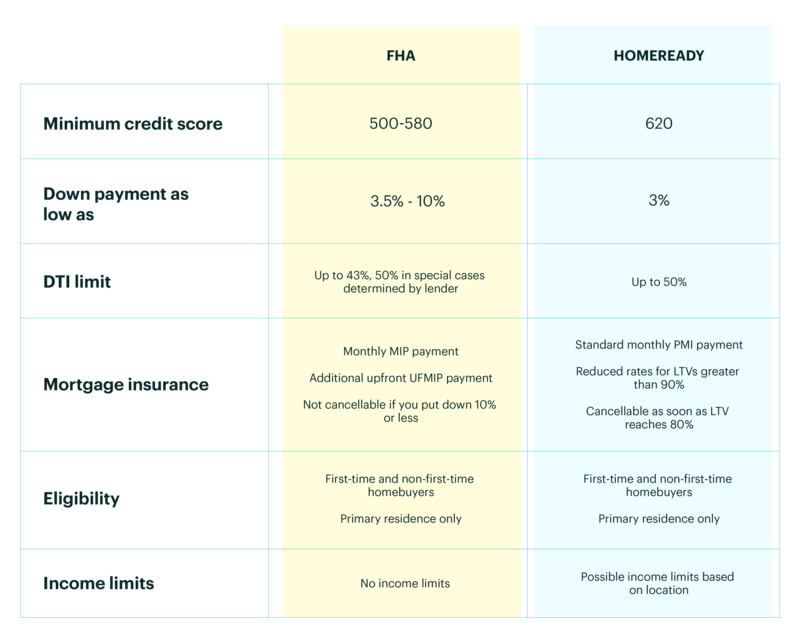 Like most loans where borrowers put less than 20% down, HomeReady’s private mortgage insurance (PMI) consists of monthly payments that are included in your mortgage bill -- there is no additional upfront fee.8 A benefit of HomeReady is that if your LTV is above 90%, the standard PMI coverage requirements will be reduced for you. And when your LTV reaches 80%, you can request to have your mortgage insurance canceled. It will automatically be canceled when your LTV drops below 78%. Together, these HomeReady benefits often result in much lower mortgage insurance costs compared to FHA, especially if your credit score is above 680. Beyond what we’ve just covered, there are some additional factors that are important to know about FHA and HomeReady loans. Both programs are available to borrowers regardless of whether or not they are first time-homebuyers. However, they are only available for a borrower’s primary residence, so you can’t use these loans to fund a second home. If you’re looking to buy a condo, FHA has much stricter requirements.9 Many condo developments are ineligible for FHA but may qualify for HomeReady. While there are no income limits in order to be eligible for an FHA loan, HomeReady may have income limits depending on the location of your property. In order to qualify for a HomeReady loan, you must either purchase a property in a neighborhood with no income limit OR have an income below the median income of the neighborhood, as established by census data.4 Our team can help you determine if your income or your property location qualifies you for the program. HomeReady also requires borrowers to take an online course that will teach them the principles of homeownership. The course, available in English and Spanish, is designed to help you gain essential knowledge to make you a well-informed home buyer. Our customers have found the homebuying course very valuable and have even recommended it to their friends and family. Better also pays the $75 course fee for you and sets up your course account, so you can get started as soon as you’re ready. 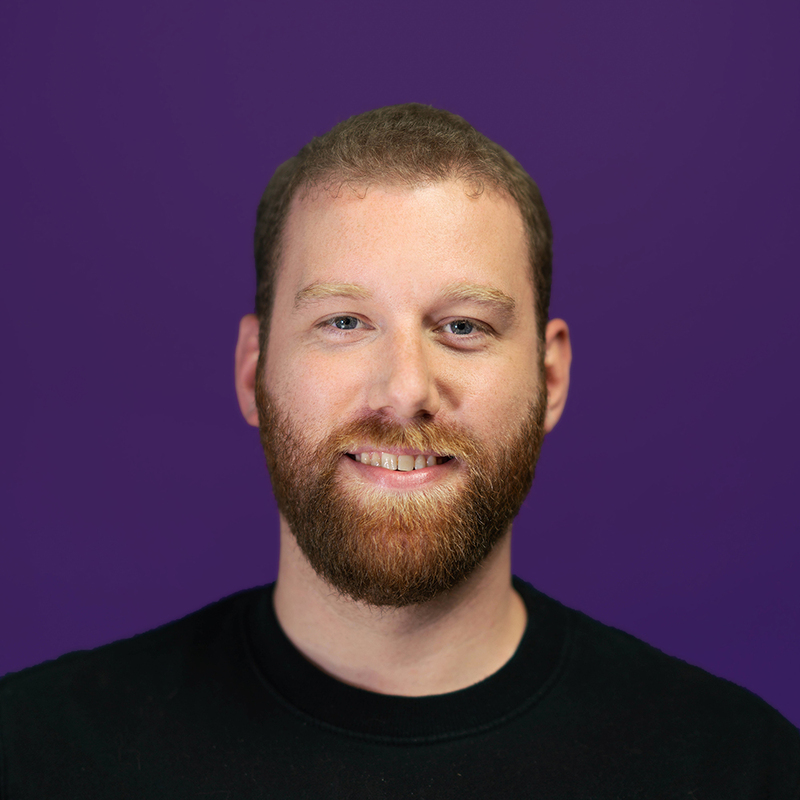 What’s the Better Loan Option for You? At Better, it’s our goal to make homeownership accessible to as many people as possible. We do this by offering as many affordable financing options as we can. We’ve chosen to offer HomeReady over FHA loans because we believe that it can be the most affordable option for creditworthy borrowers, helping them avoid high mortgage insurance costs over the life of their loan. If you’re interested in learning if you qualify for HomeReady, you can schedule a call with one of our non-commissioned Mortgage Experts.